Today is the day folklore says the groundhog will emerge from his burrow to tell us if spring will come early or if six more weeks of winter await. 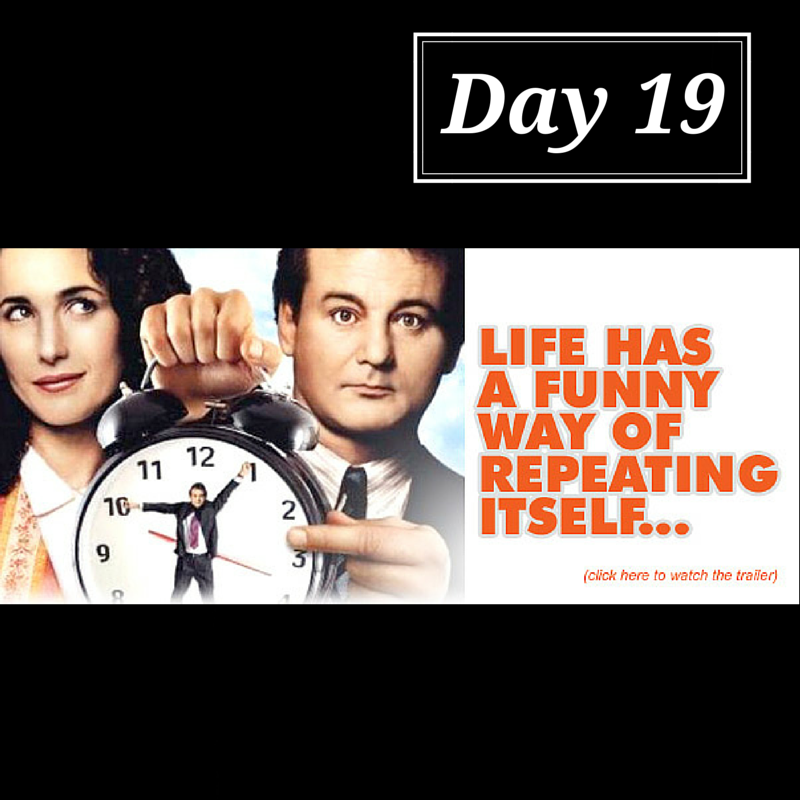 Based on this day that the 1993 film, Groundhog Day, was made. This comedy (one of my brother-in-law's all time favorites) follows Bill Murray, a weatherman, as he finds himself living the same day over and over again. If you haven’t had the pleasure of seeing it or simply want to enjoy it again, watch this short clip of Bill Murray waking to realize he’s doing and experiencing the same activities and interactions as he did the day before. Do you ever have a similar experience where you feel like you’re going crazy doing the same thing day in and day out? Groundhog Day is cute and comical but a valuable wellness principle lies within. Every day we complete countless repetitive activities which make up “our routine”. Think about your morning alone. I almost always follow the same pattern: in waking, showering, dressing and getting out the door to work. Our brain hardwires these repetitive actions and our body obeys. Ever arrive at work only to wonder how you got there? By car, train, foot or bus— if you travel the same route regularly, your brain becomes bored and devotes little attention or thought into the step-by-step actions needed for your arrival. This is why you may sometimes turn on the wrong street or drive to the wrong store, simply out of habit. Your brain registers this regularity and almost robotically completes the action for you. So what happens to our brain when it’s not bored? Did you know that when novelty is introduced into your day, you have an actual physiological response to this newness? There is a place in our midbrain called substantial nigra/ventral segmental area… or for us mere mortals, the “novelty center”. This center is also closely linked to areas of the brain responsible for memory and learning. In a study called the “oddball experiment”, researchers used fMRI to monitor brain responses when random introductions of new images were presented in a stream of the same photos. Results of this experiment showed that the brain does indeed respond to novelty. In the presence of new stimuli, the brain releases dopamine— a feel good neurotransmitter. Dopamine is often referred to as the “reward chemical”. However, more recent research suggests it actually causes the mind to to seek rewards rather than being a reward itself. This means as dopamine is released, you receive an increase in motivation to explore and experience more. Simultaneously, learning and memory centers are engaged that enhance our abilities to complete these tasks. In the study, the more novel the image, the greater the reaction was observed within the brain. As humans we crave novelty. We were created this way. Yet, most days we are engaged in “run of the mill” activities, never questioning what a mix-up might do for our mental wellness. - Wake up 15 minutes earlier to take a walk before the world awakes. New sounds, smells and people are out and about at different times during the day— all just waiting to introduce themselves to you. - Use your lunch time for something beyond lunch. I’m not condoning skipping a meal but why don’t you try going somewhere new, meeting a friend for a bite or shopping at some local stores along the way. - During a break today when you’d typically reach for Facebook, Pinterest or Instagram— do something different. Do a crossword, take a crack at a Rubik’s cube or look into learning a new skill you’ve always wanted to try. - If you usually decompress at the end of your day by absent-mindedly turning on the T.V., try tuning into music instead. Or better yet, find a card or board game you can play with your family to help laugh away the cares of the day. - Talk to someone you normally don’t interact with during your day. Expand your world to let in people beyond those similar to yourself. Not only does this introduce novelty but you’ll likely discover new friends in the process. Talk through your “typical day” with a best friend, significant other or family member. Discuss ways you might mix-up the monotony. Make a conscious choice to add, change or alter a part of your day. It doesn’t matter if you’re brushing your teeth with the opposite hand, taking a different drive into the office or adding in a lunchtime stroll to absorb some mid-day sun… your brain tingles with anticipation of all the possibilities that await!